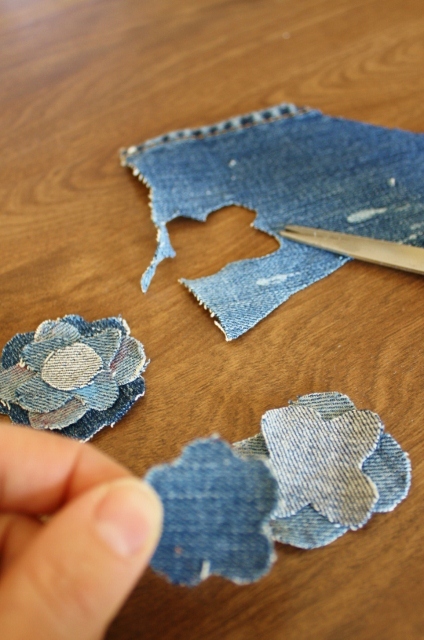 The Challenge part of the equation is to upcycle an old pair of painting jeans. Yesterday, I showed you the how-to for the head scarf I made and today I've got this cuff. As part of the challenge I've been limiting myself to just a few materials, as I attempt to reuse as much of the original jeans as possible. So far I've got the head scarf, this cuff, a necklace, a cute little ring, and a bag in the works. I hope you enjoy!! 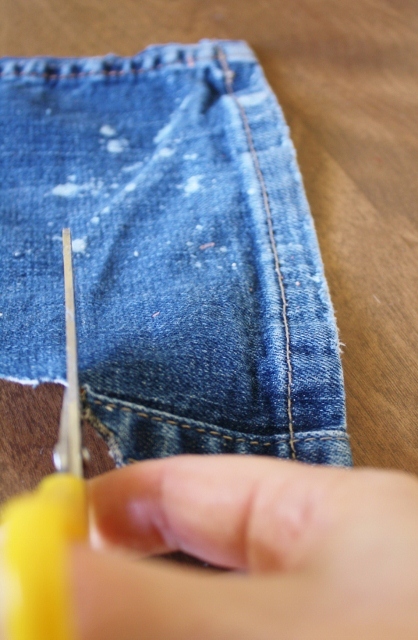 Step One: From the bottom of one of your pant's legs cut a strip that is approx. 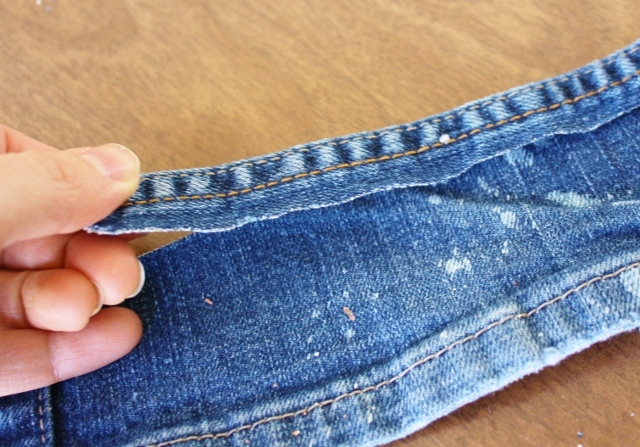 Step Two: From the inseam of your jeans cut a strip along the seam that is approx. the same length as the fabric in step one (approx. 8"). 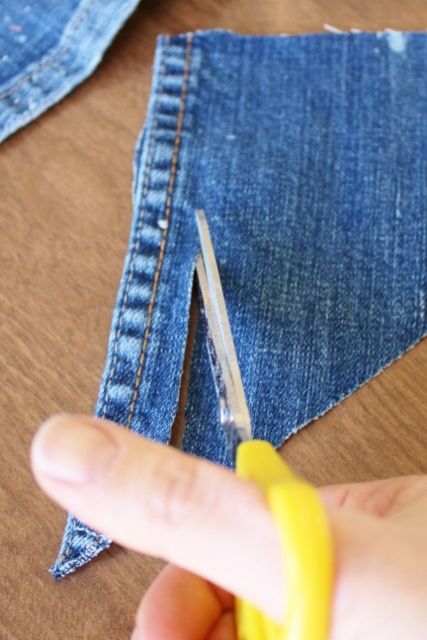 Cut close to the seam on one side but leave about a 1/2 inch fabric allowance on the other side of the strip. If desired feel free to fray this edge by pulling some of the threads out. Step Three: Using the light blue floss stitch the small strip from step two to the raw edge of the larger strip from step one. 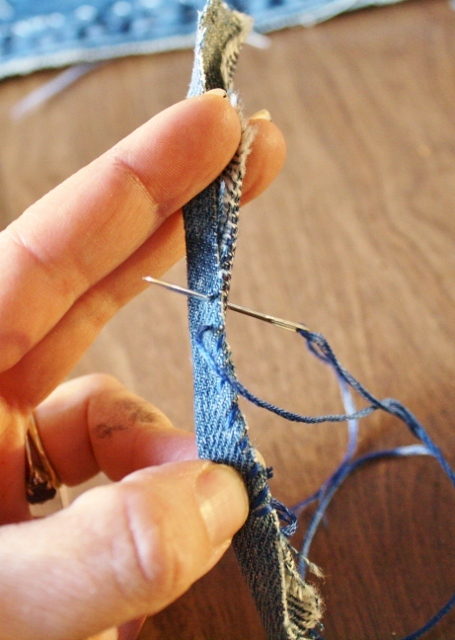 Using a "x" stitch, stitch along the bottom edge of the top strip, overlapping the raw edge and the fabric beneath with your stitches (as shown in photo for Step Four) . Step Four: At the right side of the cuff bend under about a 1/2 inch of the raw edge and stitch down for a nice edge finish. I used a straight stitch with my dark blue embroidery floss. 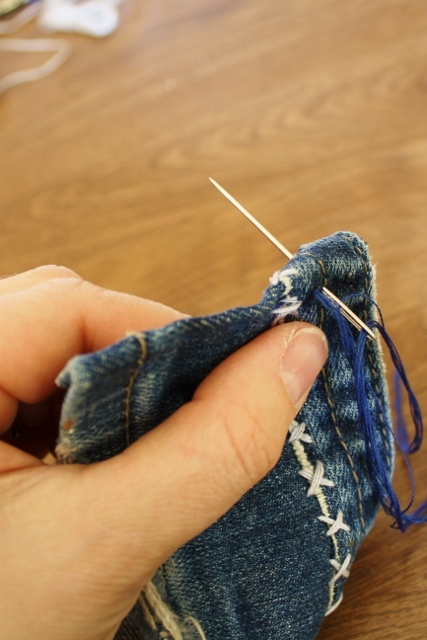 Step Five: Cut the button from the front fly of your jeans. Rather then cut out just the button, I cut a 1"x 1" square around the button. 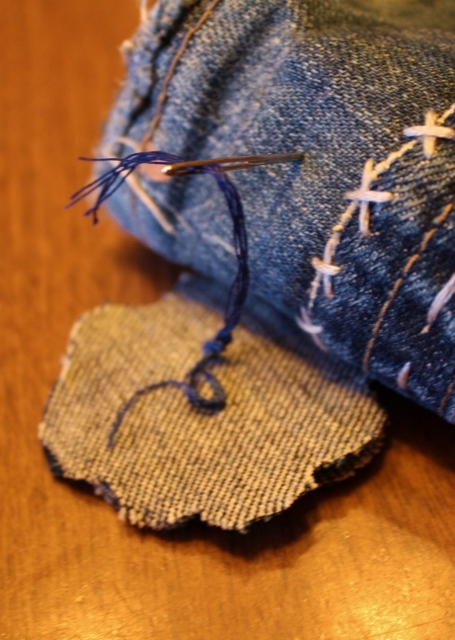 Then using the dark blue embroidery floss straight stitch this to the left edge of your cuff. Step Six: Next cut a strip of fabric from your original jeans that is about 3/4" wide and about 3 1/2 inches in length. 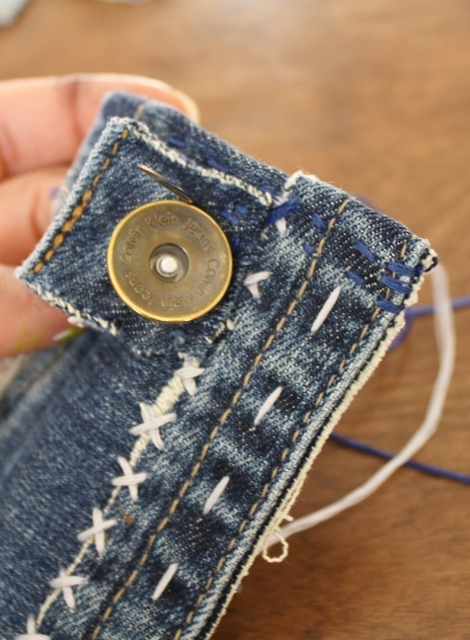 Fold fabric in half width wise and place it around the button you just stitched on, then pull around the other end of the cuff and decide how much of the loop you need to get the right fit around your wrist. Next cut the strip making sure to leave at least an extra 3/4" at each end to stitch to the right edge of your cuff. 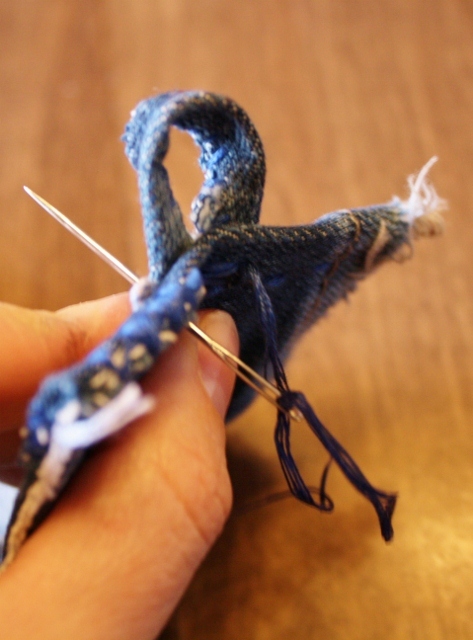 Now that you've sized it, fold it in half width wise (wrong sides together) once again and using your dark blue floss stitch the two raw edges together as shown. Step Seven: Bend the stitched loop in half and place behind right edge of cuff. Stitch securely into place. Tip: I'd double check the placement of the loop at this point by once again wrapping it around the button and then holding it around my wrist, then I'd double check how much of the loop needs to protrude from the edge. My loop sticks out about 3/4" from the right edge. 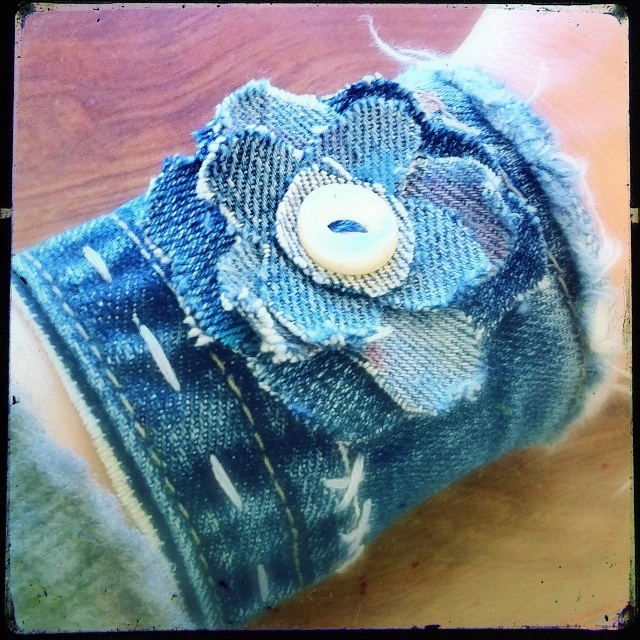 Step Eight: The cuff looks great as is, but if you'd like you could add a flower to the center front of your cuff using scraps from the jeans. I free cut three sizes of flower heads, each progressively smaller then the first. The largest is approx. 2" in diameter and is an 8 petaled flower, the second has four petals and is about 1 3/4" in diameter, and the smallest also has four petals and is about 1 1/2" in diameter. For interest I slipped over the middle flower so that the wrong side of the fabric is showing. Then cut a small circle for the center of your bloom that is slightly larger then the button you selected. Step Nine: Stack your blooms and button as desired, then using your embroidery floss, stitch through the center of the layers, up and through the button, and back down again. Repeat a couple of times. Knot securely on back side of bloom. I left about 3" of extra floss dangling from the back after I knotted and then used that floss to stitch the flower to the center of the cuff. Knot securely and you're DONE!!! Wow this is such a detailed tutorial, I can’t wait to try it! Thanks for the tips. My Art Saves Story on Crescendoh!!!! !